The story of an amazing woman who forged boldly through a scary situation reminding us that grounding helps heal. Below is an interview that I am very happy to share with you. Stefanie: Angela, why did you decide to have me journal your journey through photographs? 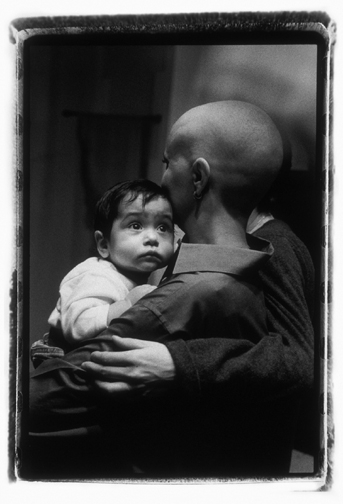 Angela: I was afraid that if I didn’t photograph it, it would be forgotten. I felt that other young woman needed to see what this breast cancer journey was, they needed to see the ups and downs and they needed to see the strengths and weaknesses. I wanted to model survival but I also wanted the world to see that breast cancer was not just pink ribbons and pink hats and pink feathers. It was, it is a battle, it’s a war. It’s really gruesome and really painful and difficult and I wanted all of that to be exposed. It was really important for me to create a visual tangible memory. Stefanie: What was the role of affirmations in the process of your journey? 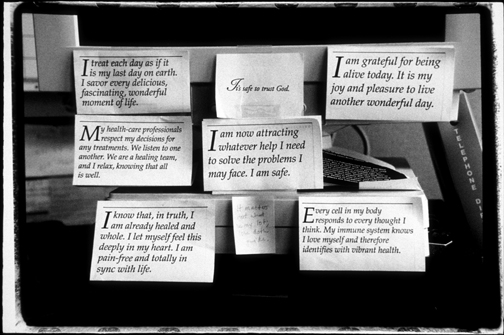 Angela: I was always looking for affirmations and I would cut them out and tape them to my computer or other important places in my house. The role was to keep me grounded and to allow me to put the horror of breast cancer into perspective, to inspire me, to keep me positive and to remind me that I was safe. The present moment was all that mattered as opposed to regretting the past and worrying about the future. There was something very powerful and calming about just staying in the present moment and knowing that I was safe in that present moment. Affirmations really helped me to remember those things. Stefanie: Why did you decide to start Bays? Bay Area Young Survivors is a support action group for women in their 20’s 30’s and early 40’s diagnosed with breast cancer. Angela: I started Bays because there were no support resources available for young women with breast cancer in the Bay area. Most of us are moms with young children or are people who are newly partnered, people just starting off in careers, people at the start of life who are facing a really devastating disease. Since cancer there are things I do differently. I try to eat organic fruits and vegetables, meat and dairy. I have reduced or eliminated red meat and try to eat only wild sustainable farmed fish. I look for only organic products. I try to use green products for house cleaning. I really believe that there are strong environmental factors in breast cancer. I don’t think it’s exclusively environmental but I think it’s a strong factor. I wish I could say I never drank alcohol because alcohol is a factor in breast cancer. It’s the one thing that they have determined is a cause. Stefanie: Do you dry clean your clothes? Angela: I still do dry clean my clothes. I try to dry clean them less frequently. I used to store them in plastic bags and I don’t anymore. Stefanie: Are you familiar with certified green dry cleaners? Angela: I am although I haven’t found any in my neighborhood but I’d love to. Stefanie: I know a great place – Pacific Heights Cleaners they pick up and deliver. Angela: Oh my god, Really?? Sign me up… I need them. and say hi to Karl for me..
and into a healthy future. The first dry cleaner in Marin and San Francisco to be green business certified by the Bay Area Green Business Program and San Francisco Environment. Using the Wet Clean dry cleaning system that is EPA approved as environmentally friendly. What Health Benefits are there to using a Green Dry Cleaner?